I couldn't play the game the first time I downloaded but when I downloaded it the second time on another computer I was able to play the game. I don't care for the Tetris like part of the game too much but once I figured out how to play the game it didn't bother me a lot. I was able to get rid of the scrap metal eventually even though I had no idea what I was doing. By the time the first enemies showed up on the screen I had figured out what I was supposed to do and how to do it. There is so much going on in this game it is a little difficult to play but it is fun too. I stopped the demo so I could type this. I have eighteen minutes left and I think I'll use them. To anyone who doesn't understand how to play the game, I can write what I do understand about the game. 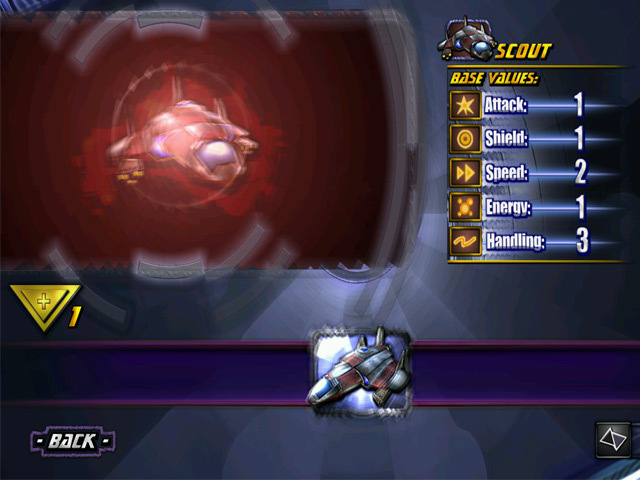 Your ship is on the bottom of the screen as is the scrap metal, enemies and whatever else shows up. There is a grid above you with falling cubes. The cubes are letters, numbers and direction arrows. Right click the mouse to: change the letter A to B,C, or D; change the up arrow to right, down or left arrows; change the number 1 cube to 2,3 or 4. There are commands in the upper left corner. 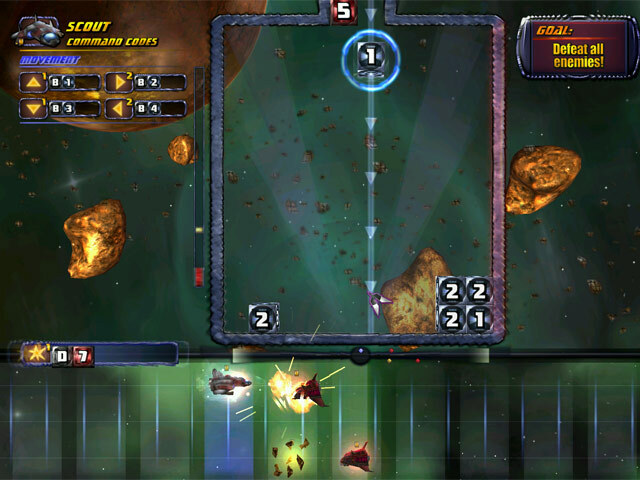 The B plus arrow keys move your spaceship in the direction of the arrows. As the cubes fall you have to create the combinations on the left hand side of the screen in order to move or fire your guns. It took me about 1/2 hour to figure this out but once I did the game was much more fun to play. At first I thought I was supposed to make match 3's but that is not how the game is played. I accidentally created enough combos to get through the tutorial. When the first ship attacked me on the second level I quickly figured out what I was supposed to be doing and how to do it. It's a fun game. I'll be spending a lot of time playing this one. Have fun players. Starlaxis has the crispest graphics & some great cartoon artwork. During the prologue you get the story of how the sun has died & a bunch of starships are sent out to gather energy to save the earth hence you become a Light Hunter. The voiceovers are really good, as is the music. This is a new developer & I wanted to see what they had produced even though I don?t play arcade style games (the game was advertised as a Match 3 but this seems to be a mislabelling as it isn't really# Things moved rather too fast for me: I was ok on the first level where you have to gather scrap but in the next level where you have to play against an enemy spaceship I failed abysmally & ended up being destroyed several times . It is not the fault of the game; it just took me too long to figure out what icon squares I had to put together in order to manouevre & by the time I did too many cubes had fallen into the play area so my options were limited. 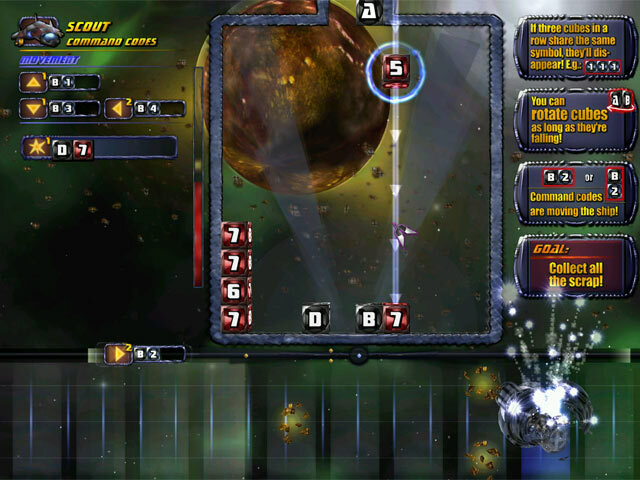 At the top of the screen is a square into which the cubes fall & you are able to right click them to define the icon, for instance a cube with A falls but click & it turns into a B or C or D. There are other icons & by combining two together you can make your spacecraft #in the oblong at the bottom of the screen) move forward, up, etc & arm your guns & the like. If you like arcade games & are faster & quicker witted than I you really should give this a try as it seems like fun. If I could slow things down for an oldster like me I would definitely buy. The game is tedious and boring. Stupidest game I ever played. I didn't even finish the trial it was so lame. Not a normal Match 3 title!!! Very Underrated! Great for strategy minded players. This game suffers from being placed under a "Match 3" category on a casual games site. It's actually more of a pseudo programming game where you combine blocks either Tetris style or in codes that instruct your space ship what to do. The 3D artwork is pretty good for a casual game, and the overall polish is decent. This of this as a kinda space-based Puzzle Quest with some strategy elements. This is probably the worst game I've ever played. Not worth the time it took to download.